Dirk. Nasty. Stig. Barry. Perhaps you've forgotten how unforgettable they are. Well, forget that. Intrepid host/interviewer Melvin Hall is here to refresh the recall of all Rutlemaniacs! Eric Idle (Monty Python) portrays Hall plus writes, produces, directs and, rumor has it, prepares off camera some well-received bangers and mash for the crew in a sequel to The Rutles: All You Need Is Cash. From concerts to backstage moments, from successes (A Hard Day's Rut) to misunderstood flops (Tragical History Tour), from familiar tunes to those that make you wonder if you left the kettle on, the whole great, hilarious tale is here. With Special Appearances by David Bowie, Billy Connolly, Jimmy Fallon, Mick Jagger, Jewel, Steve Martin, Bill Murray, Conan O'Brien, Bonnie Raitt, Robin Williams, and many more. Before 1984’s This is Spinal Tap made the world safe for mockumentaries, 1978’s All You Need Is Cash mined similar territory. Created as a TV special, Cash focused on the Rutles, a band with a distinct resemblance to a certain foursome of Liverpudlian moptops. Instead of John, Paul, George and Ringo, the Rutles featured Dirk (Eric Idle), Nasty (Neil Innes), Stig (Ricky Fataar) and Bary (John Halsey). The “Pre-Fab Four” set the world on fire with hits like “Cheese and Onions” and “A Hard Day’s Rut”. The program also introduces us to folks who associated with the Rutles back in the Sixties. This group includes German photographer Astro Glide (Catherine O’Hara), “rockologist” Hans Hankie (Robin Williams), socialite Lady Beth Mouse-Paddler (Idle yet again), record designer Kevin Wongle (Kevin Nealon), and Troy Nixon (Jim Piddock), the assistant to manager Leggy Mountbatten. DJ “Bill Murray the K” pops up in more archival footage, and we also encounter a rival interviewer (Jimmy Fallon) who tries to take over the documentary from Melvin. Billed as “Another Look at the Rutles”, Lunch acts as a scattershot history of the band. It follows them from their early days through their breakup, and it touches on their actions between those two points. Any similarity to what happened with the Beatles is strictly intentional. For reasons I can’t explain, I never saw the original Rutles show Cash. It’s funny - when I was a kid and obsessed with the Beatles, I was dying to check it out, but as an adult who could pick up the thing at a local retailer, I never got around to it. On the positive side, Lunch makes me want to give its predecessor a look, but perhaps not for the reasons you’d expect. You might think I’d want to watch Cash because I really enjoyed Lunch and desired more of the same. However, you’d be wrong. I’d like to see Cash because I saw potential entertainment in Lunch that rarely materialized, and I’m curious to find out if the original fares any better. It must, since I’d bet it includes more Rutles footage than we locate here. Those shots are usually entertaining. Sure, some of the gags seem obvious - “Yellow Submarine Sandwich”? “Banana Records”? - but Neil Innes’ Beatle parody songs are absolutely wonderful. A few emulate the source too closely and feel like Weird Al’s lame knock-offs, but most of them come across like alternate numbers the Fabs might actually have recorded. Heck, I think “Cheese and Onions” actually ended up on a Beatles bootleg because some folks thought it was the real thing! The other Rutles footage is dead-on perfect. We see loving recreations of movies and historical footage. It pays to know your Fabs history; you can compare the shots here to those in the Beatles Anthology to see how close the Rutles’ creators came. Unfortunately, this old footage serves to do little more than point out the cleverness of the original and the absence of inspiration found in Lunch. Frankly, I can’t figure out what purpose it serves other than to make a few bucks for Idle. He’s clearly the creative “force” behind this dud, so he deserves the blame for its crumminess. Occasionally the interviews offer some amusement. Raitt proves the most entertaining, as she provides deadpan recollections about how horny the Rutles made her younger self feel. A few of the other contributors add moderately funny remarks, but not with any consistency. That’s partially because so many of the comments sound the same. With the exceptions of only Martin and Connelly, every participant discusses the brilliance of the Rutles. We’re supposed to derive amusement from the fact that Martin and Connelly slam the band, but little mirth emanates from those moments. Instead, the contrary viewpoints feel forced and useless. Granted, most of the pro-Rutles remarks don’t offer any enjoyment either. Many of them focus on stale gags about the tightness of the boys’ trousers, and we find a myriad of puns that use the word “lunch”. I don’t know if someone scripted this thing or if they just turned the interview subjects loose, but it definitely feels like the former was the case. That’s not good, and it makes The Rutles 2: Can’t Buy Me Lunch come across more like a vanity project meant to be seen by a few friends than something intended for the mass public. Lunch is little more than one long inside joke without much real cleverness. 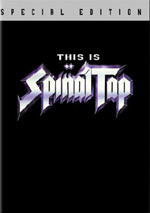 As demonstrated by the lackluster Spinal Tap reunions, it’s dangerous to try this kind of thing again. What worked once runs the risk of just being a cheap retread, and that’s the case with the tedious Lunch. 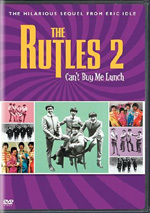 The Rutles 2: Can’t Buy Me Lunch appears in an aspect ratio of 1.33:1 on this single-sided, single-layered DVD; due to those dimensions, the image has not been enhanced for 16X9 televisions. A mix of new footage and clips created in the Seventies, the overall quality seemed acceptable but rarely better. The show demonstrated somewhat drab but decent colors. The tones came across as a little runny at times, but they mostly seemed fairly natural and clear. Blacks were reasonably deep and dense, and the few low-light shots looked acceptably concise. Given the nature of the program, Lunch seemed perfectly watchable, but it didn’t offer a strong visual presentation. It also should come as no surprise that the Dolby Stereo soundtrack of The Rutles 2: Can’t Buy Me Lunch presented a pretty subdued affair. 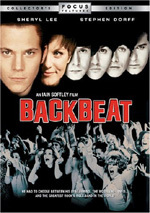 For the effects, the movie essentially demonstrated a monaural mix. On the other hand, music demonstrated pretty solid stereo delineation. The songs played a large role in the proceedings and they always offered good spread and definition. Audio quality appeared perfectly acceptable. Speech was consistently natural and distinctive. I noticed no issues with edginess or intelligibility. Music sounded reasonably vibrant and lively. The songs showed good range and dynamics. The effects were a small part of the mix. Still, they appeared clean and fairly accurate. Nothing special occurred here, but the audio of Lunch was more than fine for this sort of program. When we look at the DVD’s extras, we start with 26 minutes and 13 seconds of Additional Interviews. In these, we hear more from “Lady Beth”, Raitt, Bowie, Fisher, O’Brien, Stewart, Shandling, Nash, “Kevin Wongle”, Rushdie, Martin and Hanks. We also get a quick moment with a guy conceived at the Rutles’ Hollywood Bowl show as well as some glimpses of Rutles merchandise. Some of these bits already appear in the final piece; they just go a little longer here. We also get comments not in the completed feature. It’s basically more of the same, though, as nothing here seems terribly interesting. More unused footage appears next via eight minutes and 23 seconds of Melvin Outtakes. We see additional shots of Idle’s narration. No, this stuff’s not funny either. Lastly, we get an Alternate Ending. It lasts four minutes and 28 seconds One difference is that it shows a little more of the animated Yellow Submarine Sandwich. In addition, Melvin wraps up his narration from the police station. (That connects to a gag at the program’s start.) We also see a longer closing montage of Rutles clips. It’s not really any better than the existing ending, but it’s an interesting variation since we see more of the Rutles material and not a lot of Idle’s dull shtick. It’s that emphasis on new stabs at comedy that drag down The Rutles 2: Can’t Buy Me Lunch. When the show focuses on the clips of the Rutles themselves, it’s fairly entertaining. The updated interviews and narration are usually weak, unfortunately, and they make this a lackluster program. Picture and sound quality are merely decent, and the roster of extras seems similarly unexceptional. Stick with the original Rutles show if you want to see that material - stay far away from this stale sequel.